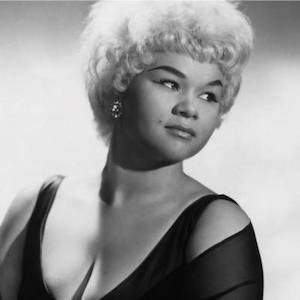 Rhythm and blues (R&B), jazz, and blues singer Etta James was born Jamesetta Hawkins on January 25, 1938 in the Watts neighborhood of Los Angeles to Dorothy Hawkins, who at the time was sixteen years old and unmarried. James received her first professional training as a five year old church vocalist from James Earle Hines, the musical director of the Echoes of Eden Choir at the St. Paul Baptist Church in Los Angeles. Soon after Dorothy Hawkins had moved her family to San Francisco in 1950, Etta Hawkins joined two other aspiring singers, Abye and Jean Michelle, to form a group which they called the Creolettes. These 16 year old singers were “discovered” by rhythm and blues artist Johhny Otis, who took them to Los Angeles to record “Roll with Me Henry” in 1954. The song, renamed “The Wallflower,” became a #1 hit on the rhythm and blues charts in 1955. Etta Hawkins, now Etta James, left the group to develop her career as a solo artist. Over the next five years she performed with legendary artists Johnny “Guitar” Watson, Chuck Berry, and Otis Redding. She recorded “Good Rockin’ Daddy” which hit the R&B charts; her other recordings were less successful. By the mid-1960s James began to battle a heroin addiction that lasted more than two decades. In 1967, while dealing with her addiction, she recorded one of her most popular songs, “Tell Mama,” which reached the R&B top ten. In 1974 James was convicted of heroin possession and forgery and sentenced to treatment instead of prison. Her addiction continued after her release, 17 months later. Only in 1988, at age 50, did James finally end her addiction. James also struggled with obesity, at one point weighing over 400 pounds and requiring a motorized wheelchair to get on stage during her concerts. In 2003 James underwent gastric bypass surgery and lost more than 200 pounds. By the late 1970s James began to record more rock and pop songs, becoming the opening act for groups such as the Rolling Stones, giving her a newer, younger, audience. James continued to record through the 1980s and 1990s, experimenting with various musical styles. In 1989, for example, she recorded a jazz-hip hop album with rapper Def Jef. Throughout the 1990s she performed at top jazz festivals such as Montreux, Monterey ,and San Francisco. By the early 21st Century James was now recognized as the matriarch of R&B. In 2001 she was inducted into the Blues Hall of Fame. Two years later she received a Grammy Lifetime Award. Her album Let’s Roll, released in 2005, won for her a second Grammy for Best Contemporary Blues Album. In 2008 the film Cadillac Records was released. The film, largely based on the story of the Chess Record Label, describes the rise of James and other blues and R&B artists of the period including Chuck Berry, Muddy Waters, and Willie Dixon. Singer and actress Beyonce Knowles portrayed James in the film. Knowles’s role led to her invitation to the White House during the Barack Obama inauguration where she performed the song “At Last,” generating a minor controversy since James said she was available to perform at the inauguration but was not invited. Etta Jamesdied on January 20, 2012, in Riverside, California of leukemia. She was 73. Etta James and David Ritz, Rage to Survive: The Etta James Story (New York: Villard Books, 1995); Pete Welding and Toby Byron, Bluesland: Portraits of Twelve Major American Blues Masters (New York: Dutton, 1991); Buzzy Jackson, A Bad Woman Feeling Good: Blues and the Women Who Sing Them (New York: W.W. Norton, 2005). American Blues Masters (New York: Dutton, 1991); Buzzy Jackson, A Bad Woman Feeling Good: Blues and the Women Who Sing Them (New York: W.W. Norton, 2005).